Get ready to explore the ground of Royalty as you stroll through the forest near the Queens castle in search of the end of the rainbow with bugs helping guide you on the right path – where very big rewards are waiting for you! 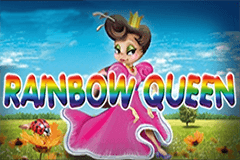 Rainbow Queen has a similar title to the Rainbow King slot from Novomatic, but it’s even more quirky with symbols of the Queen and a variety of bugs (including a Caterpillar and Beetle) that have been designed in a cartoon style and are accompanied by the upbeat tune of an orchestra when you land winning combinations – which will be frequently thanks to the free spins mode that offers 20 spins along with a Clover feature, plus there is the usual gamble mode and Jackpot Cards feature! As usual with online slots developed by Euro Games Technology, Rainbow Queen is a 5-reeled slot. This time there are 30 paylines (though you can also choose to play just 1, 5, 10 or 20 if you’re short on funds) rather than the usual 10 and 20 their slots offer, and greater takes are on offer too as you can play for 30, 60, 150, 300 or 600 coins. Along your journey through the Queens forest (a forest was also the setting for the Fortune Spells slot machine and the Game of Luck slot machine which are fellow EGT slots) you’ll encounter all kinds of bugs that have character in abundance with animations playing out when they are part of winning combinations, with eleven symbols in total, all of which are bursting with colour and emphasise the fun theme. The standout symbol is the glamorous Queen who is donning a bright pink dress with a crown on her head as she poses in front of her extravagant castle and she is the Wild symbol, possessing the ability to substitute for the Scatter symbol, but it’s important to note that she never makes an appearance on reel one, only the second, third, fourth and fifth reels. The Scatter symbol is simply the Rainbow Queen logo which has all seven colours of the rainbow and this only appears on the second, third and fourth reels. A whole host of bugs live in the Queens forest with the most valuable being the Grasshopper which smokes a pipe in the sunset, while there is also a sleeping Beetle, a very cute Caterpillar, plus a Firefly that is bright lit up at dusk. Completing the range of symbols that you’ll experience along your adventure are the Ace to 10 playing card symbols which all have different colours and are situated on top of a leaf, expanding and contracting when part of a winning combination – and as you’ll probably already know they are the lowest valued symbols hence they appear pretty frequently. As you stroll around the forest you’ll find yourself on the right trail for the pot of gold at the end of the rainbow whenever you land the Scatter symbol on the second, third and fourth reel. This triggers a blooming great free spins mode that sees large yellow flowers cover the reels to congratulate you and state the number of spins you have received – which is a very generous 20, not often we see that in slots from EGT, plus you receive an instant win worth double your stake. During your free spins you’ll also be introduced to a new symbol, a four-leaf clover. This can only land on the fifth reel but each time it lands it moves down into an area below the reels where there are twelve slots (three next to each of four symbols which gets filled up with clovers). Once you get three of them a new Wild symbol is introduced to the reels and therefore at the end of the feature you can have some very large wins! Rainbow Queen isn’t a blockbuster, but it’s certainly a very fun and uplifting slot machine which is bright with colour and offers big wins to brighten up even the gloomiest of days! It will probably prove more attractive to the female demographic but for the ‘macho-men’ amongst you that find this slot too ‘girly’ check out the Imperial Wars slot machine which sees you take to the battlefield where claiming victory earns you big rewards.